Los Angeles camping may seem like an oxymoron, but it isn't. 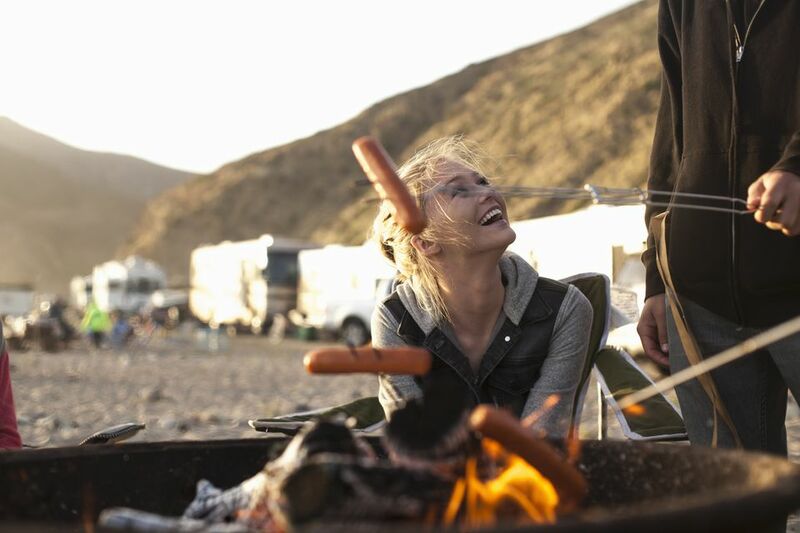 In fact, if you're on a limited budget, passing through in an RV or just prefer to sleep under the stars, these camping spots and campgrounds are all in the Los Angeles metropolitan area. Before you start looking for your perfect camping spot, it may help you to know a little about Los Angeles area geography. Los Angeles is America's second-biggest city, but it's also a county. The area commonly called the "basin" sits inside the coastal mountains. It includes the city of Los Angeles, Pasadena, Hollywood, Long Beach and a host of other municipalities. Most of the major LA tourist attractions are located in this area. Campgrounds are scarce in busy, crowded Los Angeles, but you'll find a couple of options here, including one that's actually on. the. beach. Dockweiler Beach: Dockweiler is our readers' favorite Los Angeles campground and with good reason. It's located just below the LAX runways and right on the beach. In fact, it's one of the prettiest places in Los Angeles to park your camper. Sorry, but no tents are allowed. Golden Shore RV Resort, Long Beach: Right on the waterfront in downtown Long Beach. No tents, but tent trailers are OK. These campgrounds are located on the south-facing coastline in or around Malibu, west of Los Angeles, and Santa Monica. They're along CA Hwy 1 and are listed in order from east to west (the first one is the closest to LA). Malibu Beach RV Park: They have almost 100 sites for both RVs and tents. It's on the cliffs just above Dan Blocker State Beach. Malibu Creek State Park: This location has been used to film so many movies and television shows that you may have a sense of deja vu when you arrive. They offer tent and RV camping. Leo Carrillo State Beach: 28 miles north of Santa Monica. Tent and RV sites are available. Point Mugu State Park: RV and tent camping in a pretty park along the ocean. Some campsites are in Sycamore Canyon, across the highway from the beach. Others are along the beach. Los Angeles is an immense place, and these campgrounds can be a long drive from some of the popular tourist spots. A good map will be your best friend as you figure out whether their location will be right for you. Disneyland Area Camping: If you're visiting the Disneyland Resort or other sights in Orange County, you've got quite a few campgrounds to choose from. Catalina Island: You'll have to take the boat to get there, but it's a nice place to get away from it all. Find out where you can camp and what you need to know before you plan your trip. More Beach Camping in Southern California: It's a short list, but you'll find a few more places in Southern California where you can camp right on the beach. Pomona Fairplex KOA: Pomona is on the northeast side of the LA Metro area, about 35 miles from downtown Los Angeles. This KOA is located near the Pomona Fairgrounds, where the Los Angeles County Fair is held every year. It's also the site of swap meets and other events. The campground has RV and tent campsites and Kamping Kabins. East Shore RV Park, San Dimas: The "shore" in the name refers to Puddingstone Lake. This campground is about 25 miles from downtown Los Angeles. They can accommodate RVs, and they also have a few family tent camping sites. Valencia Travel Village: North of the Los Angeles Basin off I-5, this full-featured campground is close to Magic Mountain. They have more than 350 RV sites, two swimming pools and lots of other guest amenities. Walnut RV Park, Northridge: Northridge is in the San Gabriel Valley, outside the Los Angeles basin but still convenient to Universal Studios and Magic Mountain. It's 20 miles from downtown Los Angeles. Balboa RV Park, Van Nuys: It's located near the intersection of I-405 and US Hwy 101, just north of the Sepulveda Pass which leads into the LA basin. The area is close to Universal Studios and on the way to Magic Mountain. It's a large park with full hookups, laundry room, cable TV and internet access.